Solar energy is to me the panacea for Africa, a continent where 550 million people still lack electricity. With molten salts, concentrating solar could bring light to these populations during important parts of the night. Solar cookers could also help fighting deforestation by removing the need for fuelwood. Now an experiment run in Benin (West Africa) shows that pumps using solar PV panels are bringing several improvements to local populations. Drip irrigation systems need pumps to operate. To date, they are using engines running on kerosene. 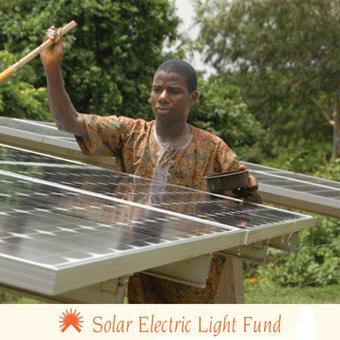 The Solar Electric Light Fund (SELF) believes solar could replace them. Drip irrigation systems are crucial to ensure a secure food supply to many sub-Saharan countries like Benin. Enabling them to run on solar is a fantastic way to enable them to feed themselves in the most sustainable way. (d)espite higher up-front costs, using solar power to pump water can be more economically sustainable in the long run than irrigation systems that run on liquid fuels, such as gasoline, diesel or kerosene. “When considering the energy requirements for expanded irrigation in rural Africa, photovoltaic drip irrigation systems have an additional advantage over liquid-fuel-based systems in that they provide emissions-free pumping power,” they added. “Overall, this study thus indicates that solar-powered drip irrigation can provide substantial economic, nutritional and environmental benefits,” the authors said. After watching this great video you might be willing to give money to this NGO. Please note that giving $100 (less than 70€) you will enable six or seven families of Africa, Asia or Latin America to have access to solar electricity. Bringing electricity to Africa, one village at a time.